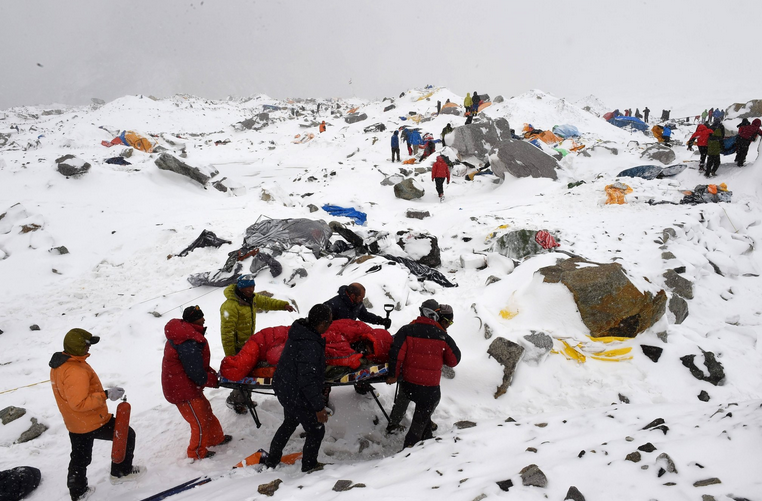 Roberto Schmidt, the chief photographer for South Asia for Agence France-Presse, was at the Mount Everest base camp in Nepal when an avalanche triggered by a massive earthquake hit. His dramatic images of the avalanche and its aftermath were published around the world. Mr. Schmidt, 49, recounted his experiences in a phone conversation with James Estrin, which has been edited. Q. Why were you at the base camp? A. 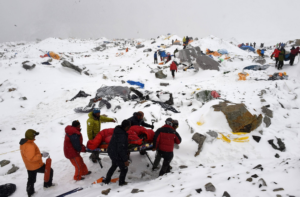 We had planned to do a couple of stories at the base camp a year after the disastrous avalanche that killed 16 Sherpa guides. Ammu Kannampilly, a reporter who is the bureau chief for the A.F.P. office in Nepal, was with me and also doing video. It was a coincidence that I was there when the earthquake hit. A. Unexpected. We had just arrived and I had walked up a little ahead of my colleague Ammu, and we were staying in a tent camp that a trekking company had up there. I got to the main tent — a dining tent — maybe five meters long by two-and-a-half meters wide. I was just relaxing there after the hike up. The base camp is over 5,000 meters high, and for someone who is not used to it, that elevation can be pretty taxing. Ammu came in and was joking with me and then the ground started shaking. The funny thing is I thought the tremor was caused by an avalanche. I had no idea that there was an avalanche starting to form and that it was caused by a massive earthquake with the epicenter just west of Kathmandu. We walked out of the tent to see what was happening and then we heard this very loud, deep rumbling noise. Though I am far from an expert mountaineer, I knew something was coming. It was a very cloudy day so you couldn’t see anything when you looked up. The noise got deeper and stronger and Ammu rushed into the tent to get her camera. I turned to my left and looked up and suddenly out of the clouds came this massive exploding avalanche of snow that looked like a cloud. I just had time to raise my camera and shoot three frames. As I looked through the viewfinder, I thought, “Man, I’m shooting too tight.” I then dove into the tent and shouted to Ammu, “Get down, get down, get down!” because this thing was right on top of us. I don’t remember hitting the ground or getting under the table. There was a sudden wind and then just a crash like a wave. It was like when you’re in the ocean and you measure the waves wrong and a wave comes and crashes over you and you’re tumbling right-side down, right-side up. You have no idea what’s happening. To read the rest of the artical from Lens go here.